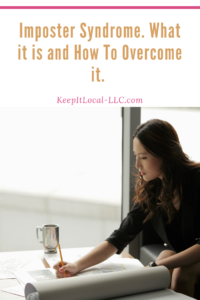 Have you heard of imposter syndrome? In a nutshell, it’s a thought pattern that causes a person or professional to doubt their expertise, knowledge, and accomplishments resulting in a fear that makes them believe that eventually they will be exposed as a fraud in their niche. Have you ever had that feeling before? I think most people have at one level or another. 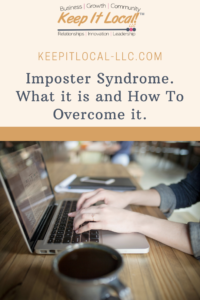 In this post, we will explore imposter syndrome, what it is and how to overcome it. As I explained in the opening paragraph, imposter syndrome is a fear of being exposed as a fraud and can cause a huge amount of anxiety. This type of anxiety can slow, stop, or stunt professional and personal growth through negative self-talk, doubting your ability, embracing feelings of inadequacy, failure to take chances, and self-sabotage just to name a few. If you recognize that you may be suffering from imposter syndrome, here are some things you can do to overcome it. Recognize that imposter syndrome exists and that there is good news! Imposter syndrome is a thought pattern that can be changed! Know the facts. Take the time to write down your accomplishments, recognize and OWN them! See them as FACTS in your professional journey. The more you know and understand the facts about you and your professional life, the less you will feel like an imposter. Develop new and positive self-talk. You become what you think. The more you tell yourself a story or narrative, the more you believe it and then it materializes! If you tell yourself you are an expert in your field, that the work you do is excellent, etc. you will deliver on that. Celebrate victories! When you are winning, celebrate in that! Reward yourself when you close a new deal, deliver an outstanding product or service, or solve a difficult problem. STOP looking for external validation. Don’t only rely on other people’s compliments to validate how you feel. Yes, it feels good when you are complemented but you also need to do that for yourself. The minute you give that power away, you give away your confidence. Taking the time to celebrate wins and losses will help you conquer imposter syndrome. Embracing the journey of your career and understanding that it won’t always be perfect and that mistakes will be made will make a huge difference.